How to Get Your website Listed in Google Answer Box? Getting your website listed on answer box can increase it's trust and reputation besides sending tons of referral traffic that might help to increase conversions. Google is taking one step at a time to become an answer engine and for many queries that you enter on Google, it directly returns an answer in place of 10 blue references asking the user to find the answer himself. This approach of becoming an answer engine similar to Star Trek is a dream of Amit Singhal, the head of Google search ranking algorithm. What is an Answer Box? Answer box is an area that appears right above the organic search results. It displays a direct answer to the user query. Sometimes, this box might display reference to the website whose information is displayed in the SERP. Getting your site displayed under this box directly means that Google trusts the answer to the query provided in that site. This certainly helps to increase the trust and reputation of the site in the eyes of users. For a query "symptoms of typhoid", we get the following answer box with a link to the site webmd displayed right below the answer. The answer that Google displays comes directly from the Webmd site. 7- Answer written should either be cited from an authority site or the site should itself be an authority. 8- Only answers from unbiased, non profit, news based, high authority, high trusted sites are included in the answer boxes. 1- Site has high DA - 95. 2- Site is a trusted source of medical information cited by several reputed websites. 3- Site has several references mentioned in Wikipedia which makes it a part of the trusted seed network. 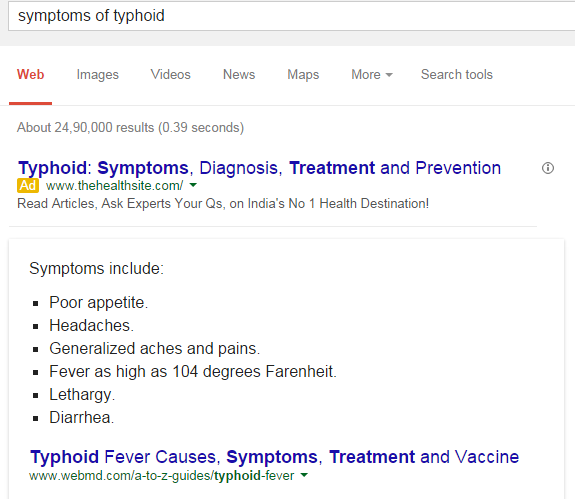 4- The content accurately describes the symptoms with the heading as "What Are the Symptoms of Typhoid Fever?". Hope this gives you an idea as to how you should frame your content in order to make it eligible to get listed under Google answer box.